I recently recommended a GameStop Corp. (NYSE: GME) trade to my Money Calendar Alert subscribers. On Thursday, it became a double – our fourth in two weeks. But how we got set up for that trade is important; GameStop was a great play, but the next one is coming up soon. You don't have to have an eagle eye on the markets all day, either – even though I think that's fun. "Make that good 'til cancelled," I always say after putting in every trade. 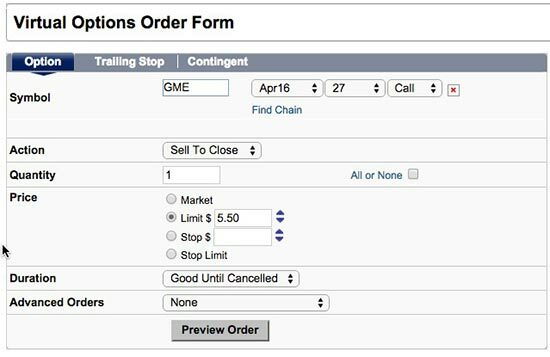 The good-til-cancelled (GTC) order type can be used on stocks and options. Now, it's important to note here that the New York Stock Exchange recently stopped accepting good-til-cancelled orders and trailing stops, but the Nasdaq accepts them, and besides, any brokerage worth the name will happily take these for you even if you're trading on the NYSE. That order stays with your broker for a full 30 to 90 days, or until you cancel it yourself, which is about the time frame most brokers will allow an order to sit around on their books. It's so powerful because it gives you the space you need to be patient and make sure conditions are best for you to make a killing. 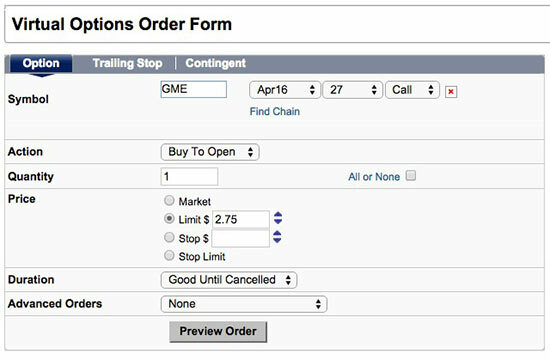 The GameStop trade had a limit order price to buy the April 2016 $27 calls at $2.75. On the day the order filled, it did so at the beginning of the day – for almost the entire rest of the day, it had no more fills at that price. You see, new traders have a tendency to start chasing the option. The price of the option bumps up a bit – away from them – by, say, $0.25. And so they try and go get that slightly higher perceived price only to see it bump up another $0.25, and so on, until… they end up paying too much, or at least more than they had as their original limit. A GTC order gives you the space to maintain that all-important discipline – and let the trade come back to your limit price – rather than "chase and overpay." Case in point: This option came back to that $2.75 on Wednesday, and could have been filled at that limit price on that day. The GTC order can work on a closing order just as well as it can on an opening order. Once the trade was filled, one could place a "sell-to-close, GTC order" on the options. Since the fill was at $2.75, a double – a 100% return on investment (ROI) – would be $5.50. There's one more thing: If you see profit on the position before the price of your sell-to-close, GTC order hits, you can still go ahead and close the position. In order to do that, I would encourage you to take caution and cancel the GTC order first, then place a new sell-to-close order. The GTC order is the perfect trick for a trader who can't spend all day in front of their trading terminal, or if you're tempted to chase a trade. Doesn't matter whether you're in the office, getting your brakes done, hanging out with the grandchildren or fishing – once that sell-to-close, GTC order hits, your order will fill and your profits will be waiting for you the next time you check in on your trades. 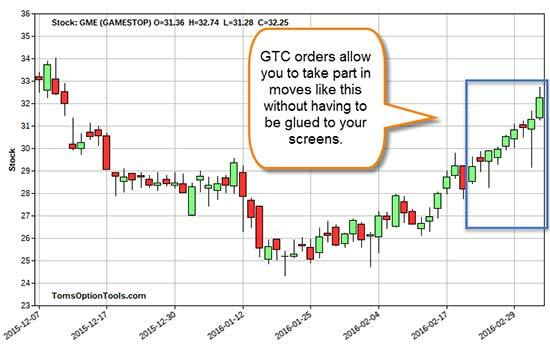 The way I see it, the GTC order allows you to be able to trade, profit, and have a life. Follow Tom on Facebook and Twitter. 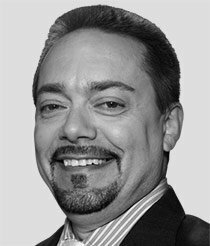 Tom Gentile is a world-renowned options educator. Twice each week, he publishes his Power Profit Trades to show his readers how fun, easy, and lucrative options trading can be – in any market. Click here to start getting Power Profit Trades yourself, at no charge, and you'll get his latest investor briefing on how to make a cool 100% gain on one of the world's most profitable companies… in less than 30 days. Tom great article and advise. Did exactly that got fill the next day and went on to get a double.. Some of the best advise you could have given. May not get into all the trades but the ones they do usually turn out positive. Interesting article, thanks. The problem I see with GTC option orders is that your order bears no relation to the price of the underlying. In your trade, if GTE should quickly drop a couple of points, your buy gets filled, but at a price that is a gift to the seller. In the early days of the CBOE, you could enter orders in terms of parity, like "buy at parity plus one-half, GTC." This automatically adjusts your price as the underlying stock moves. But, (I'm told) that order form is no longer acceptable. Is there some other way to prevent getting hosed by the market makers? Tom, I have a question in regard to verticle spreads. I am a new trader and I currently call in my trades to PNC trade desk,sometimes my opening positions come in a little higher than the alert limit recommendation as an example Mar 7th SPY Apr. 8th 2016 $200 call filled at $2.59. I can't put in the Exit Strategy until the position fills and my question is should my 100% double be increased to $5.18 or should I keep it at $4.00 as per the alert? On a past trade I used the higher price on the Exit but fortunately I had "Good till cancelled" on the order and closed it out with a good profit.